Most folks seem to instinctively compare the iPad and the tablet market to the iPhone and smartphone market, and it’s easy to see why. They share the same OS, the same competitor, many of the same apps, and, of course, the same time period – the present. But in reality – and this touches on many of the themes of this blog – an overt focus on product similarities misses many crucial factors that, in my opinion, make iPhones and iPads very different. In fact, I believe the business we should be looking at to understand where Apple might take the iPad is the iPod, not the iPhone. This is the most pertinent fact, by far; nearly every point flows from this fundamental distinction. The result is that in many important ways it’s the carrier that owns the customer relationship. Moreover, of all the smartphone OEMs, it’s Apple that is by far the biggest threat to that relationship. Therefore it’s very much in the carrier’s interest to push customers to other phones when possible, and there are widespread reports of smartphone OEMs further incentivizing individual salespeople to sell competing smartphones. The iPod and iPad, on the other hand, are primarily sold through traditional retail outlets, including Apple Stores. It’s Apple that owns the customer relationship, primarily through iTunes and the App Store. In many ways the iPhone has been a devil’s bargain for Apple; they make obscene margins – over 50%, on average – in exchange for ceding the customer relationship to the carriers. 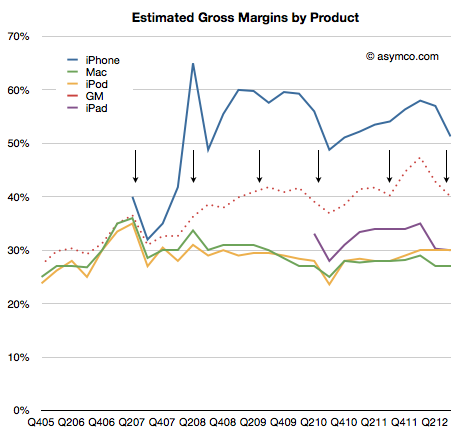 Moreover, these margins restrain Apple’s strategic options. Apple currently simply isn’t competitive in countries that don’t subsidize phones. I absolutely believe that Apple could make a high quality “cheap” iPhone for $199 with their traditional 30% margins ($140 COGS); that’s much more unlikely when there is real pressure to stay closer to 50% ($100 COGS). The (allegedly) impending cheap iPhone is going to either disappoint Wall Street by cutting margins or be priced higher than it should be ($279 instead of $199). It’s a critical decision and a real test of Tim Cook’s priorities (more on this in a moment). The iPod and iPad, on the other hand, have long hovered around a 30% margin. Graph is from asymco.com. Click the image for the original article. While Apple is likely reluctant to drop too far under that line for the same reasons as the iPhone, a 30% margin-target gives them a lot more flexibility than does 50%. While the iPhone is on over 200 carriers, it only covers about two-thirds of the world’s population; moreover, it’s not always available on your preferred carrier. In addition, from a retail perspective, there just aren’t that many places you can buy an iPhone, particularly in subsidized countries. The iPod and iPad face no such restrictions. They are sold in Apple Stores and vending machines and everything in-between, and in (effectively) every country in the world. Everyone owns a phone. In fact, far more people own phones than own computers, and those phones are increasingly smart. That means the basis of competition is which phone to get, and price is often a critical factor. For both music players and tablets, however, it’s a different story. The critical decision is whether to buy or simply go without. This strongly favors the dominant player, particularly if said player was first-to-mass-market and has a strong brand, because the dual decisions of whether or not to buy and which to buy become fused: someone decides to buy an “iPad,” not a tablet, or an “iPod”, not an music player. While Apple currently sells three different iPhones, each was once the flagship. This is certainly tied in part to the margin and subsidization point made above; building the same phone for three years brings down costs substantially, and provides good-enough options when the customer only sees one-third of the true cost of the phone. iPods and iPads, however, which are sold at full price, necessarily segment the market by price and product attributes. Sustainable differentiation and increased consumer preference trajectories suggest higher prices and an opportunity for competitors to be low-cost competitors. Yet the evidence suggests this hasnʼt happened. The original iPod launched in 2001 at a price point of $399 for 5 GB of storage. Its primary competitor was the Creative Nomad Jukebox which had 20 GB of storage, although it was significantly larger and more difficult to use. It also cost $399. The iPod did not face a large number of similar specced competitors until late 2004. However, even then the price remained quite competitive. By 2004, Apple was also showing its willingness to cover as many price points as possible, offering products from $249 to $599. 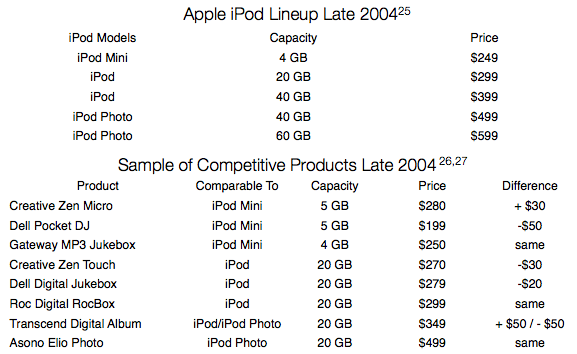 By 2007, the lineup had extended in both directions, and while competitors had for the most part standardized on the same capacity as the iPods, they werenʼt necessarily less expensive. The iPad started out similarly; competitors had a very difficult time matching the $499 entry price. And then the Kindle Fire came along in 2011, for only $199. The reason the Fire was so cheap gets back to one of the primary differences between the iPod and iPad: the competition. While the iPod faced its share of low-priced knock-offs, its brand-name competitors had the same business model as Apple – i.e. selling hardware for a profit. Selling-for-profit versus selling-at-cost is a much tougher competitive position than Apple was in with the iPod, and makes it highly unlikely the iPad will ever be as price competitive as the iPod was (which means it won’t ever see the same 70% market share over time, either). However, I don’t think this means that Apple is simply going to flee upmarket. In thinking about where Apple will take the iPad, I’m reminded of two quotes in particular. At the critical juncture in the late ’80s, when they should have gone for market share, they went for profits. They made obscene profits for several years. And their products became mediocre. And then their monopoly ended with Windows 95. They behaved like a monopoly, and it came back to bite them, which always happens. A price umbrella is when an incumbent maintains high prices, allowing low-cost competitors into the argument. Apple ruthlessly eliminated the price umbrella in music players, but while they closed the umbrella somewhat with the iPad mini, the competition isn’t exactly getting wet. I believe the iPad is much more like the iPod than the iPhone, and I expect Apple to treat it as such. For structural reasons, Apple can’t and won’t match Google and Amazon pricing, but I believe they will be more aggressive than most people expect with this year’s upgrade cycle. In a future post I’ll dive into why I guessed these specific price points, as well the other critical difference between iPods and iPads: iPads are a platform (which also pushes for lower prices). Whatever happens, the pricing and segmentation of the iPad is a critical decision for Apple, of similar import as how to price a cheap iPhone.